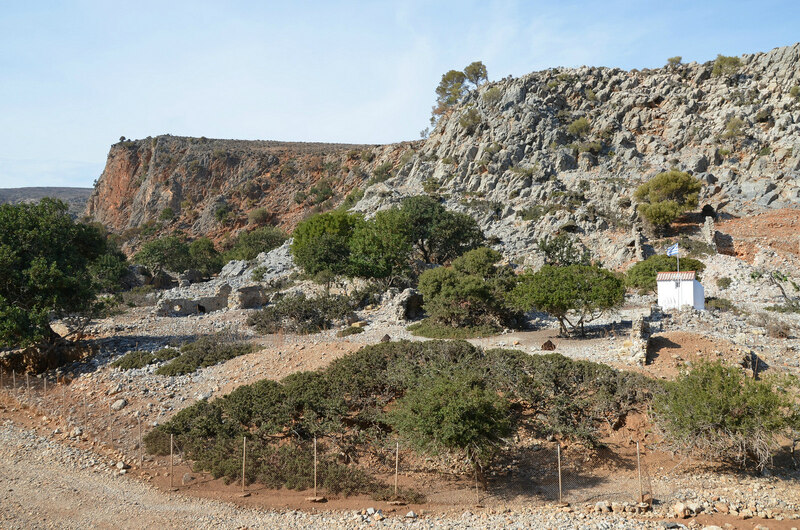 On the eastern tip of the Rodopou Peninsula in West Crete are the scanty remains of a temple dedicated to the Cretan goddess Diktynna (Diktynnaion). Diktynna was the virgin goddess of hunting and she was worshipped fervently in western Crete as the patroness of hunters and fishermen. 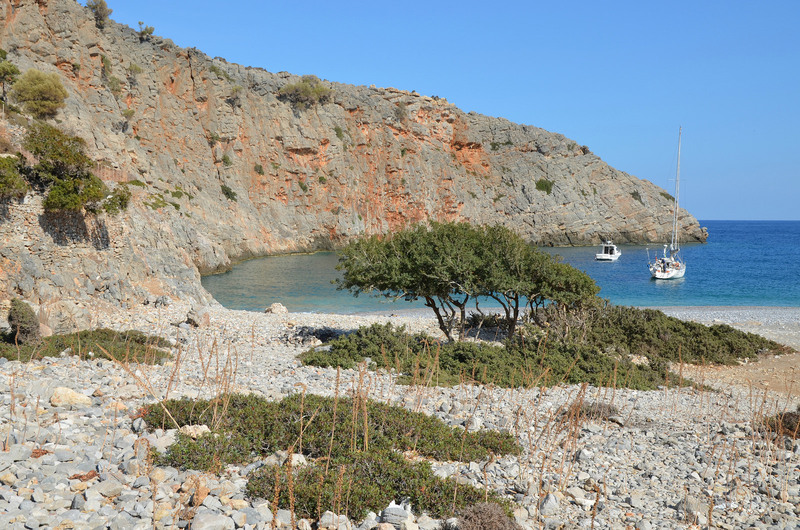 The Diktynna Sanctuary and the beach of Menies on the Rodopos Peninsula. Diktynna’s name may be connected with Mount Dikte but the Greek historian Strabo tells us that it derives from the word diktyon, meaning ‘net’ (Strab. 10.4.12). Legend has it that when the lustful king Minos attempted to seduce her, she fled his advances and threw herself into the sea. She was caught in the nets of fishermen (diktyon) and carried to the safety of the island of Aegina. The fisherman Andromedes attempted to seduce her as well. She fled into the forests of the island and disappeared in the sanctuary of Artemis who made her a goddess (Paus. 2.30.3). Diktynna was also known as Britomartis (“Sweet Maiden” from the ancient Greek words britos and martis) and was closely identified with the goddess Artemis. However, on Crete itself, Artemis, Britomartis and Diktynna maintained separate identities in cultic contexts. Diktynna had a temple on Mount Tityrus near Cydonia (Strab. 10.4.12). 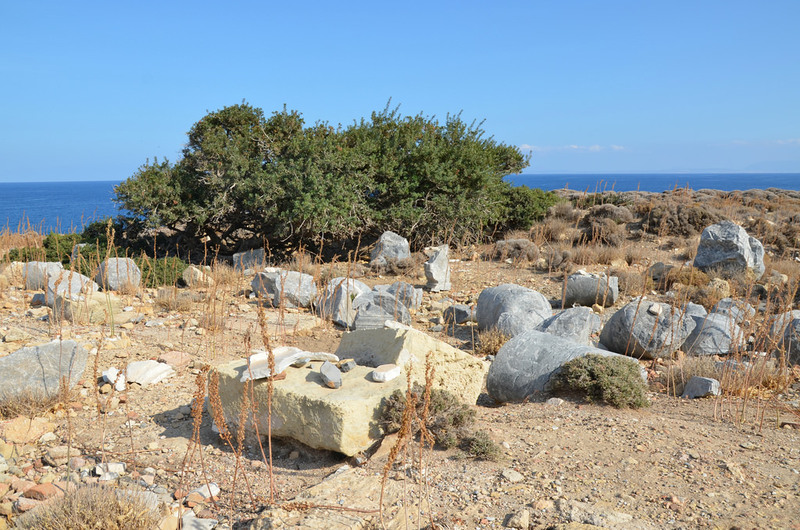 On the island of Aegina, she received the surname Aphaea where her temple can still be seen. Like Artemis, Diktynna was a huntress and the deity of nature, the wild countryside and mountains. Statue of Artemis/Diktynna, found in 1913 in the Diktynnaion sanctuary, Roman Period. Archaeological Museum of Chania, Crete. Diktynna was portrayed on Cretan coins of the cities Kydonia, Polyrrhenia and Phalasarna. Coins of Imperial times represented her as a mountain mother, connected with Mount Dikte, where, according one version of the myth, Zeus was born. 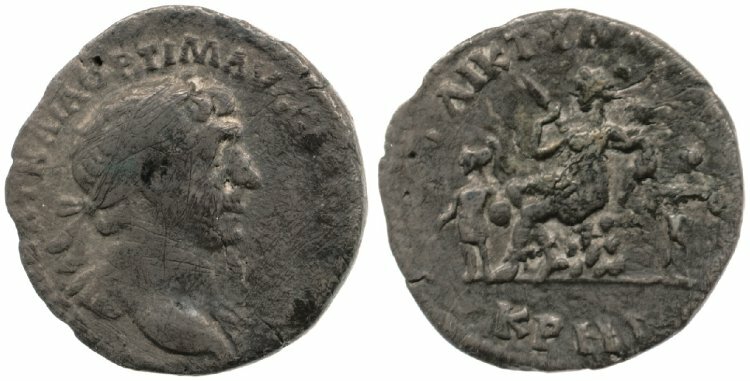 Towards the end of Trajan’s reign in 115-117 AD, silver coinage minted by the Cretan Koinon had Diktynna on the reverse as kourotrophos (child nourishing) of Zeus. Trajan AR Drachm from Crete. (obverse) Laureate head of Trajan, right. (reverse) Diktynna seated left on rocks, holding javelin and infant Zeus; helmeted Curetes to either side. A principal centre of her worship was at the Diktynnaion on the north west coast on a high promontory between Phalasarna and Kydonia. 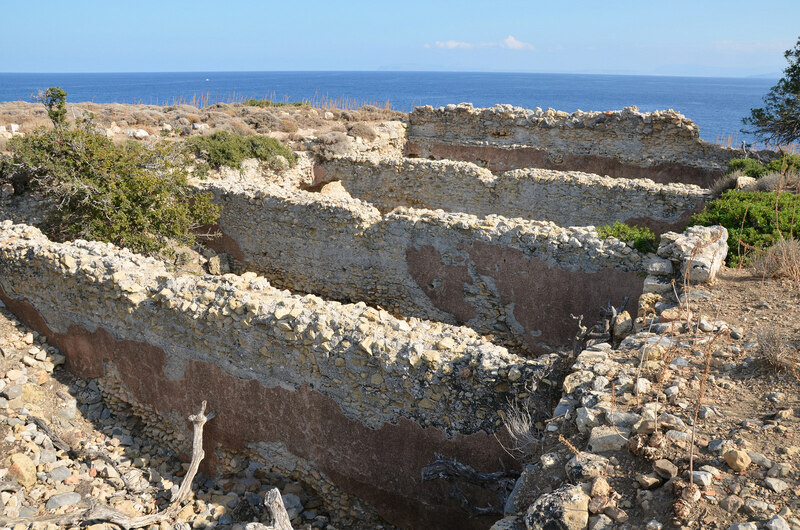 The sanctuary was first mentioned in the 5th century BC by Herodotus (3.59) who ascribed the building of the temple to the Samian colonists at Kydonia (ca. 524-519). In the late Hellenistic and early Imperial periods, the sanctuary appears to have been controlled by the Polyrrhenians. According to Philostratus, the sanctuary was visited by Apollonios of Tyana in the mid-first century AD and its wealth was so enormous that the temple was guarded by dogs which the Cretans claimed to be as strong as bears (Philostratos, Life of Apollonios 8.30). Worshippers would have come with offering from all over Greece as well as from other parts of the Mediterranean. It was custom for them to come barefoot with their rich offerings in order to be in direct contact with the earth and nature which the Goddess personified. 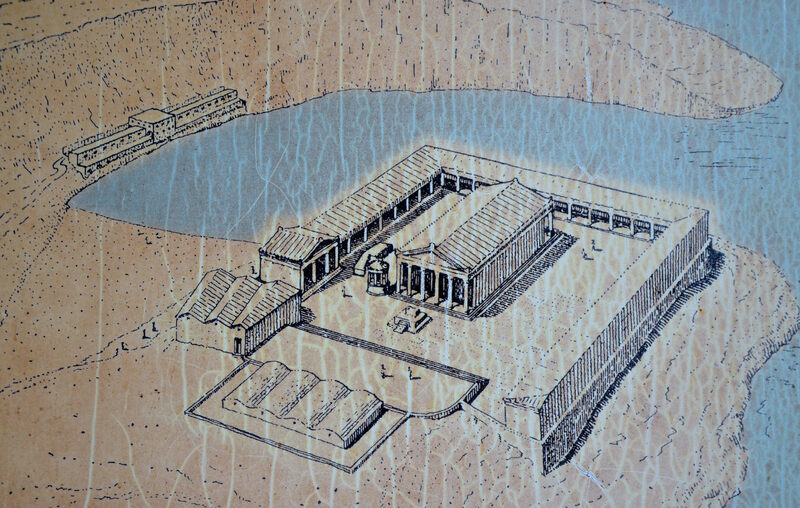 Reconstruction drawing of the Sanctuary of Diktynna at the time of Hadrian. 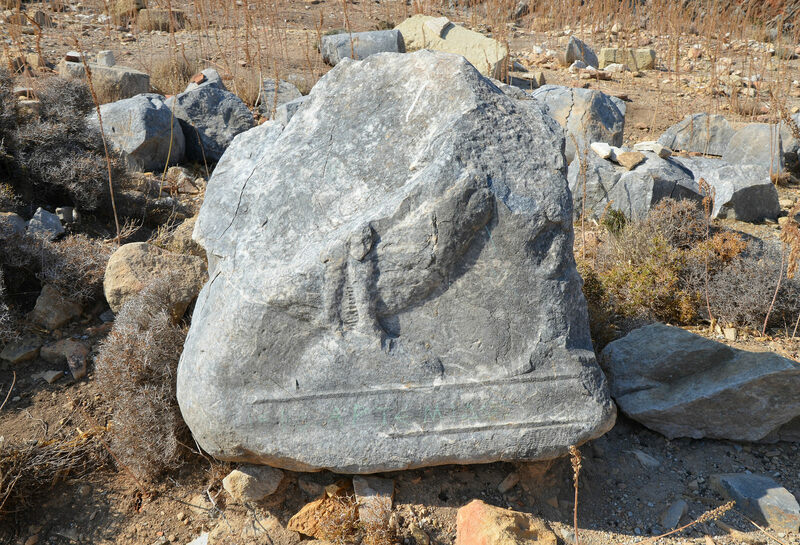 The oldest finding on the site of the temple dates from the late 7th or 6th century BC. In the Late Hellenistic period or in the 1st century AD, a rebuilding of the complex was started but was never completed. The sanctuary seems to have flourished especially under Hadrian during which time a new temple arose and a paved road down the peninsula to the sanctuary was built (or rebuilt). In the 19th century a milestone was found near the village of Rodopos mentioning the distance of its initial position to the sanctuary of Diktynna (11 Roman miles). Milestone exhibited in the village of Rodopou. 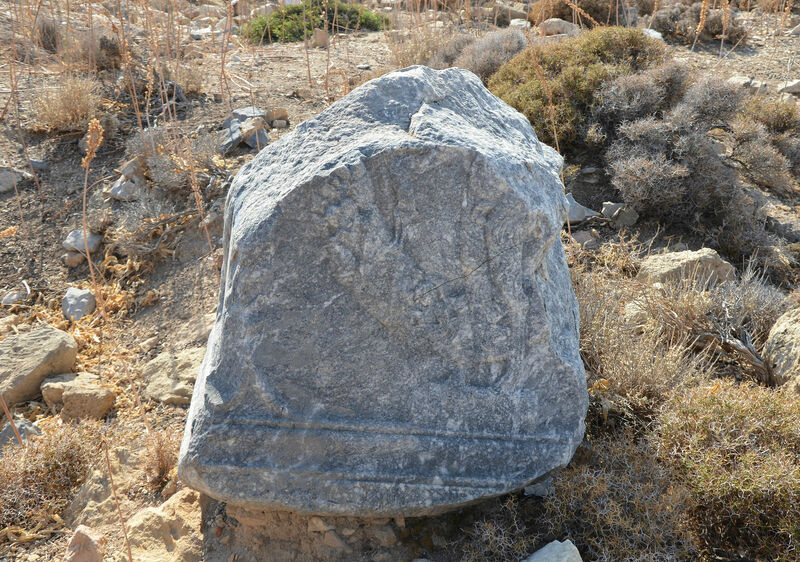 According to the Latin inscription inscribed on the milestone (AE 1902, 0180), the road was constructed on the order of Hadrian with funds provided by the sacred treasury of Diktynna. pecunia sacra deae | Dictunnae fieri iu[ssit] | XI. order to construct this with the sacred money of the goddess Diktynna. 11 miles. 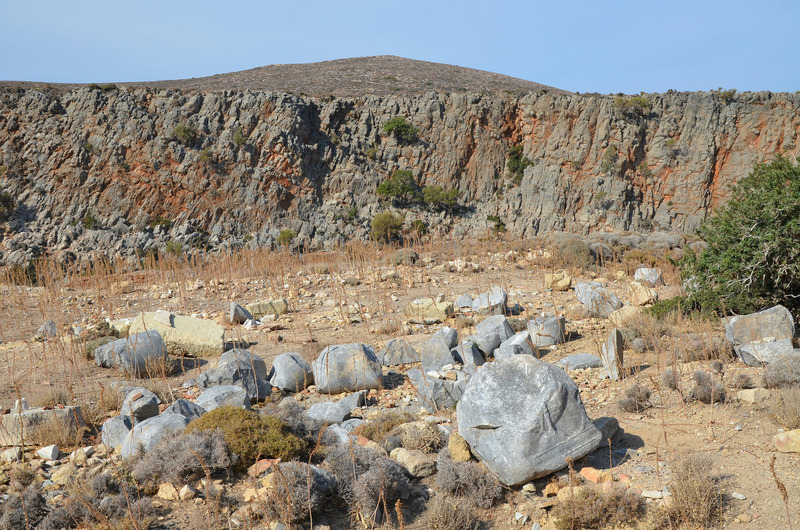 In his paper “Hadrian, Diktynna, the Cretan Koinon, and the Roads of Crete: A New Milestone from Faneromeni (Crete)“, Angelos Chaniotis tells us that on the basis of the reference to Hadrian’s third consulate (cos. III – 119 AD) and the title proconsul (proc.) 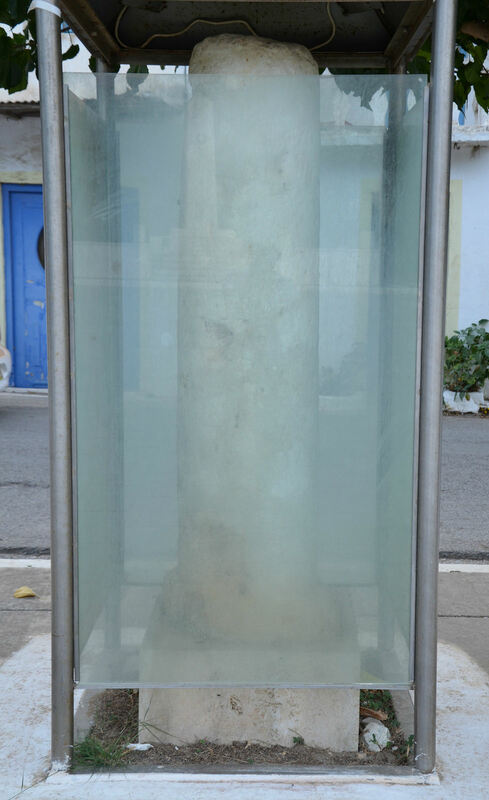 used in official inscriptions of Hadrian between mid-129 and 132 AD, the milestone can be dated to ca. 129–132 AD. Hadrian stayed in Greece three times; in 122/25, in 128/29 and finally in 131/32 AD. However, no written source expressly mentions the visit of Hadrian to Crete. Nevertheless, the honorary inscriptions and statues of Hadrian found on Crete provide considerable support for the hypothesis of Hadrian’s stay on the Aegean island during one of his travels to the eastern provinces. Known since the 16th century, the site was identified with the Diktynnaion mentioned in ancient sources in 1739 by English prelate and anthropologist Richard Pococke who referred to the ruins as small and of marble and speaks of cisterns and columns existing in his time. He also provided the first archaeological maps of the remains (see Maps of the archeological sites of Dictamnum). 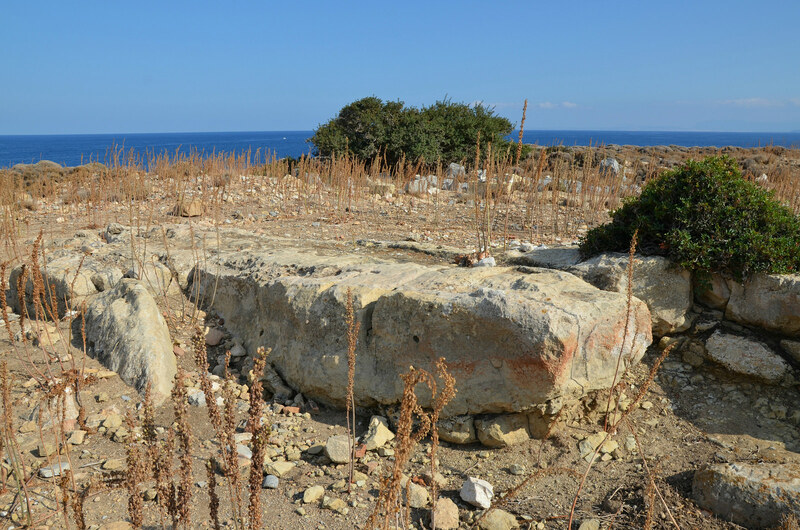 The only archaeological excavations were undertaken by German archaeologists U. Jantzen and G. Welter in 1942 during the occupation of the island, but the documentation was lost in the war. View of the Sanctuary on Google Map. 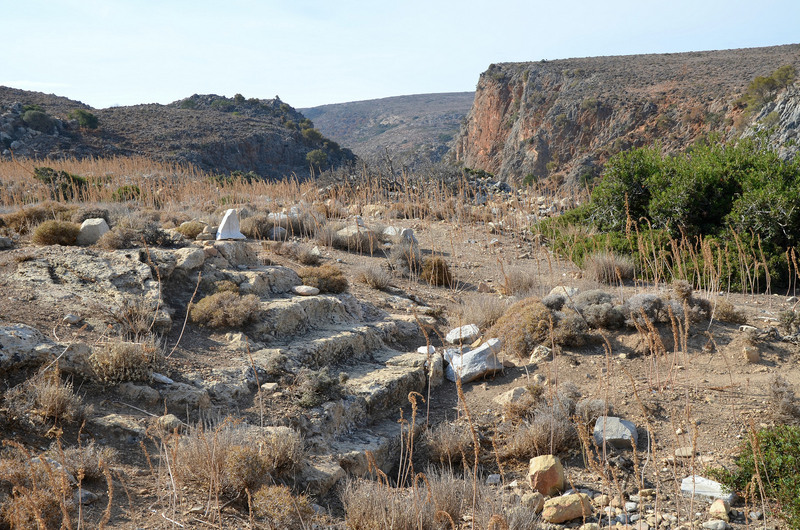 The scanty remains of the Temple of Diktynna with fragments of columns scattered on the hill. 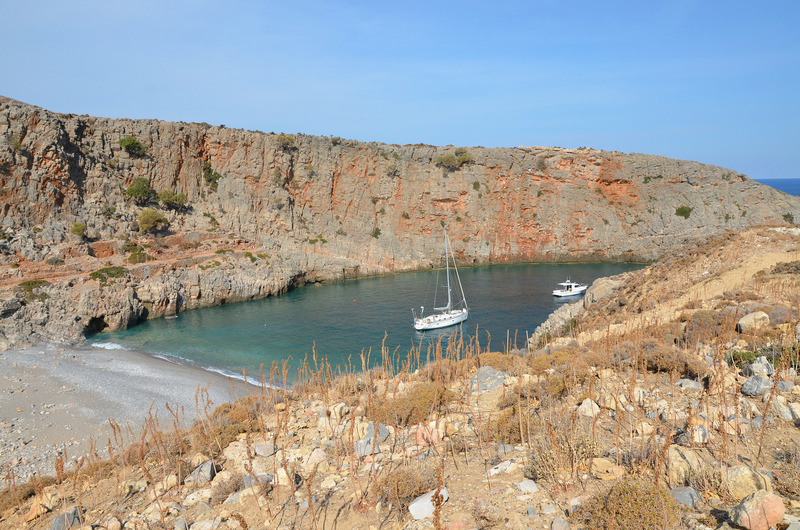 The Sanctuary of Diktynna lies on a rocky bay above a small cove, on the east side of what was the Tityros peninsula in antiquity, 4 km south east of Cape Spatha (ancient Psakon). The Hadrianic temple was amphiprostyle (having a portico at each end but not at the sides) with a sacrificial altar of white marble to the south west. 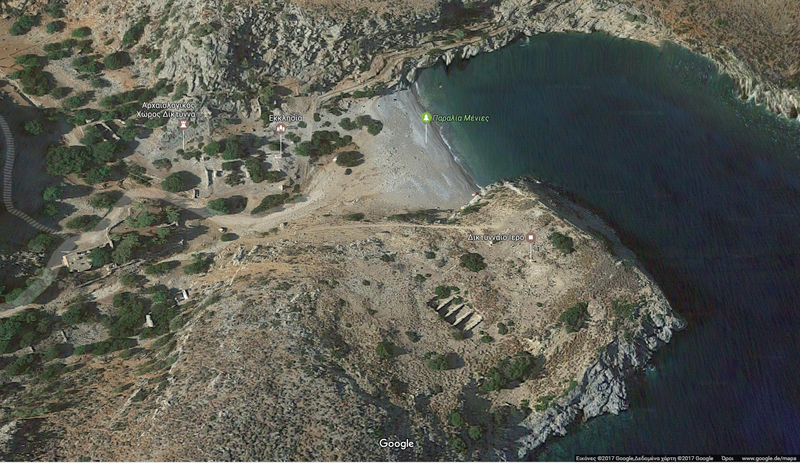 It was built over the remains of a previous Doric temple, apparently planned in the Augustan period but never completed. The temple stood in a paved courtyard surrounded by colonnaded porticoes on three sides using both blue and white marble. At the southwest corner of the temple, there was a small circular structure, where the statue of Artemis/Diktynna with her hound was found. In front of the temple, a higher terrace was approached by steps on which lies a row of four massive cisterns. The steps of the higher terrace of the Sanctuary. Fragmentary base of a column from the cella of the Hadrianic temple with a partially preserved relief of the god Pan who may have also been worshipped in the sanctuary. The foundations of the sacrificial altar. Pedestal of a column with partially preserved relief with a garland. Fragments of columns scattered on the hill. Four Roman cisterns may lie the site of an earlier late 7th century BC temple. By the propylon that served as the entrance to the sanctuary was a Roman storage building. To the west of the cisterns may lie the site of an earlier late 7th century BC temple. In the valley below, west of the temple and along the bay are the remains (Hadrianic or later) of buildings used to accommodate pilgrims. They may also be the remains of small houses, an odeum, and an agora complex with a room for the imperial cult. There are also the remains of a Roman aqueduct which provided the priests and visitors with water. The valley below the Temple of Diktynna. The remains of buildings to accommodate pilgrims can be seen along the bay. In 1913 two portraits of Hadrian were found at the Diktynnaion. The first one is a full-length cuirassed statue bearing a head of Hadrian crowned with the corona civica (civic crown). The statue, presenting the emperor as commander in chief, was largely destroyed by fire a decade after its discovery. Only the head, the legs and the plinth remain today. The head, of the Vatican Busti 283 type, now stands in the Archaeological Museum in Chania. Portrait head of Hadrian wearing the corona civica, 2nd century AD. Marble; Chania Archaeological Museum, Chania, Inv. No. 82. 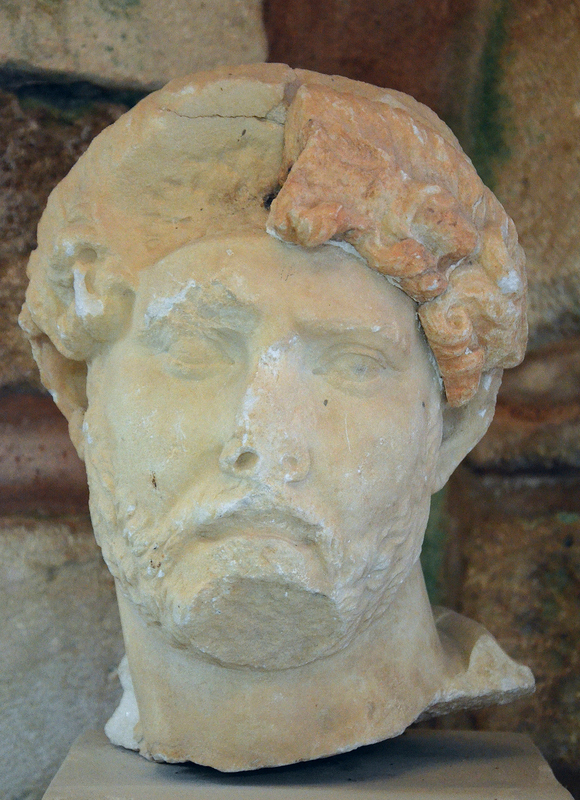 The second portrait of Hadrian found at the Diktynnaion is a fragmented head that probably belonged to a statue. The nose, the chin, part of the hair on the right side of the head are broken. A small part of the paludamentum (short military cloak) drapery is still visible, showing that the statue was also bearing a military cuirass. The face of Hadrian is idealised. The head is turned toward its left and slightly raised, in an echo of the late Hellenistic pathos. It is also in the Archaeological Museum in Chania. Portrait head of Hadrian, 2nd century AD. Marble; Chania Archaeological Museum, Chania, Inv. No. 77. 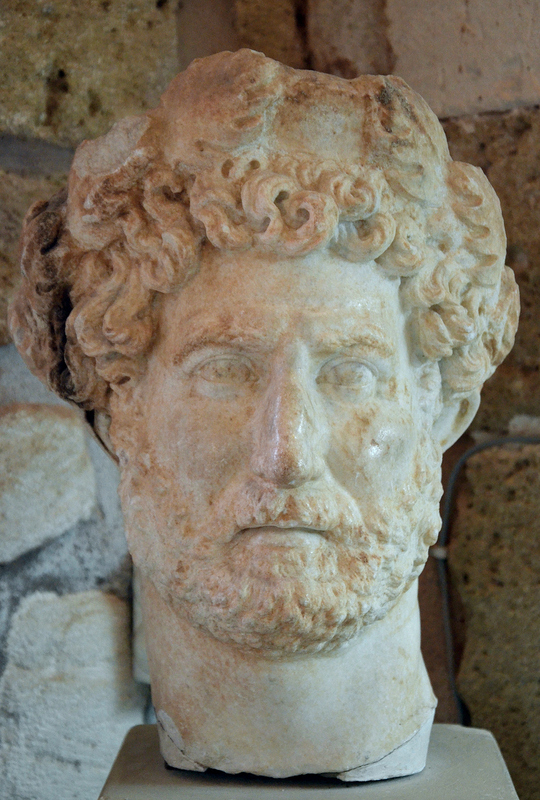 As Katharine A. Raff from the Department of Ancient and Byzantine Art at the Art Institute of Chicago puts it, “these portraits of Hadrian, with their cuirassed body and bearded head, might have conveyed to the viewer in Crete general messages of Hadrian’s military and political protection and potentially also a sense of his Greek cultural interests”. The island of Crete totals more cuirassed statues of Hadrian than any other region of the Eastern Empire. Regarding these, I. F. Sanders in his Roman Crete (1982) made the following observation: “…Crete has more than the average number of heads and cuirassed statues of him [Hadrian]. Knossos and Kissamos each have one and there are two each from Gortyna, Hierapytna and the Diktyannon with a further head from an unknown site in the Louvre. There is no proof that he ever visited the island, but it was on his route in 123 on the way from Africa to Asia“. During the dark ages and following the collapse of the Roman Empire the sanctuary was abandoned and looted by pirate raids. To visit the Diktynnaion is a small adventure. The peninsula where the sanctuary is located is remote and difficult to access. An arduous dirt road of almost 20 km leading from the north of the village of Rodopos runs to the Menies Bay with the last few kilometers to the cape only practicable with a 4×4 vehicle (I left the car along the way and I walked the last 7 kilometers). The bay is apparently also reachable by sea from Kolymbari. Apollonius’ ascension, from: K. Demoen, D. Praet (eds), ΘΕΙΟΣ ΣΟΦΙΣΤΗΣ. Essays on Flavius Philostratus’ Vita Apollonii (Leiden/Boston 2009), 225-248. I really enjoyed the video of the road trip. It makes you feel like your there. What an effort they made to build a temple there. Wonderful post as always. You are a knowledgeable scholar and it has been a pleasure to follow your travels these years. As a ‘fan’ of Hadrian and his time I greatly appreciate your effort and skill at presenting. Wow! You really know your stuff on Diktynna! I never even heard of Britomartis.